When many people reach a career milestone - be it getting a job with that great new company or even starting their own business - they often leave the concept of education behind. After all, they've already had a huge amount of schooling up to this point and they've succeeded in accomplishing what they set out to, so it probably isn't even necessary anymore, right? Career advancement is a journey that never ends and continuing education is one of the single, best ways to make this road the easiest one of you've ever traveled. Even if you're completely satisfied with your current position and can't imagine ever wanting to go someplace else, continuing education is still valuable for a number of different reasons. Think about your long-term career goals. Where do you see yourself in a year? In five years? In ten? Even though you're satisfied today, there will still likely come a day where you begin looking for a change or what a little something "extra" out of your current situation. Continuing education not only makes it easier to ask for a raise within your current position, but it also makes you more attractive if the time comes where a management position opens up within your business that you might want to pursue. Many experts agree that when hiring managers start to look at internal candidates for a new position, they actually grade on a tougher scale than if they were looking to fill a position from outside the company. At this point, a simple history of "hard work" and "dedication" isn't necessarily going to cut it - their expectations are higher than that. They KNOW you're a hard worker - it's why you still have a job. 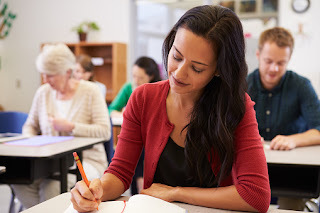 A history of regular, continuing education says that you've taken your dedication to a new level and that you're not only ready for new responsibilities, but you have the ethic and the skills to back up that claim. The late, great comedian Garry Shandling was a firm believer in the idea that the minute you stop working to improve yourself either personally or professionally, it's all over. He was the type of person who believed that his work was never done. There was ALWAYS something he could learn and ALWAYS some way he could improve the quality of the product he was putting out into the world. He deeply stood by these ideals, even though by any objective standard he perfected not only the sitcom but also the comedy television format with his HBO series (and he had the dozens of Emmy nominations to back that up). Yet still, it wasn't enough. Just like Shandling, the moment you feel you've learned it all and the moment you feel like you've reached the point where you can't get better, you've lost a game that you never really understood in the first place. This simple idea is perhaps the most important reason why continuing education is the key to career advancement, regardless of the type of industry you're working in. It forces you to think about ways that you could be doing better and about the shortcomings in your daily life that you need to address. It keeps you moving forward, but it keeps you grounded at the same time. Continuing education doesn't just make you a better employee on paper because you get to add a new certification or qualification to your resume - it makes you a better person, period.